Latinas Make the Society Page! Who would have thought that we'd see this day? Not my 83 year old dad who saw some harsh times in Texas. It always makes him proud when he says how far we have come. My friend Angie Moreno and member of the host committee for the Sor Juana Festival put it best, "I think this is the bridge we're gapping between the elite and the underground artists, as well as reaching non-Latinos/Latinas." Then check out my friend Angie's letter to the paper. They chose her letter for publication in today's paper. The news coverage this festival has received has been great! There are still so many great events planned. I'm going to the Frida play (The Brow) at TBH next month. I entered the 24/7 Diary Entry Project for Lady Speed Stick. Submissions with a March 27, 2007 date may also qualify for a chance to be published in Joni Cole's upcoming book, This Day in the Life of Working Women. Yes, yesterday was another adventure. Rey's car overheated on me this time! It's becoming a huge comedy now and each day I'm waiting to see what new thing will happen to me. Pretty crazy!! I'm driving the rental car now and I've left poor Rey with his car, which looks like it's going to the shop next. :( So far the bill for our SUV is nearing the $2,000 mark! After dedicating this month to volunteer work I will feel really good about moving forward and picking up where I left off with some of my other projects. Next I am going to pick up my novel again and will continue to submit it to literary agents. I really haven't tried hard enough and I have many more agents to contact. I will continue with my revisions in the process. I would like to have a flawless manuscript when the Chica Lit Fiesta comes around. You never know! In the meanwhile I am going to do my very first chapbook! I'm really excited about this project. I'm going to do a chapbook with all of my father's original stories. I'm going to write the introduction about how my father's stories have influenced my writing and I'm going to add two of my short stories, based on his stories. I'm going to self-publish and we'll see where it goes from there. And most importantly I need to pick up where I left off on my change of lifestyle. I need to start moving again. Walking at Memorial and Studewood parks or the neighborhood, going to the gym, and eating healthy. I'm back on track because I have quite a few goals to work towards. First there's my health, then there's my district convention in June, then Chica Lit Fiesta in August, and finally, there's my 20 year class reunion next Spring or Summer. Yikes!! All great milestones to measure my progress. And we're off! What a Month and It's Not Even Over! I have had an absolutely wild month and I haven't really mentioned it here. I committed to volunteering 50 hours this month to the ministry. That means 50 hours of talking to people about the bible. It's been a really good month. I even started a bible study with a woman. I go to her home once a week for a one-on-one study. All of this is done on my free time and voluntarily. However, as Murphy's Law would have it, it's also been the most challenging month ever. I have had so much happen! I chose March for three reasons. The main one was that I would be off the week of Spring Break and that would help me get a lot of time done that week. The other reason was that it's the month leading up to the Memorial of Jesus' death which we are celebrating on April 2. (We follow the Jewish calendar.) We invite people to this special celebration. And the other reason was that the time changes in March which gives me extra day light in the evenings to get time done. All of these were great reasons and it would all have worked out in theory if it weren't for all the unexpected challenges that arose. I had a couple of unexpected visitors, and while I enjoyed their visit, it still meant a change in my schedule to accommodate visitors. My cousin visited for 3.5 days and my husband's friend visited for 1 week and 2 days. There was only 2 days between their visits. Next was my lovely SUV. The battery died on that thing at least 3 mornings in a row during my vacation week, making it close to impossible to make it anywhere on time. Yet I still managed to get out and to follow my time schedule. Yesterday I talked to one of my friends from my congregation and I was telling her in a nutshell all of the above. I told her that I felt really good about today and that I would be getting back on schedule this weekend to meet my goal. Last night the baby was feeling unusually warm. I tried taking his temperature but the baby ear thermometer has seen it's last days. I could tell he was running a fewer just by feeling him so I gave him some Motrin. He woke me up at 6 this morning still burning up so I decided to get aggressive and I gave him the Tylenol/Motrin mix. We slept a few more hours and needless to say I didn't get out in service as planned. I was hoping his fever would go down and maybe we could get out this afternoon but of course it didn't happen that way. He's still really warm and at 11 a.m. I had to give him the follow up Tylenol dosage. He seems to have gotten even warmer since then. Now I'm waiting for 1 p.m. to give him the Motrin and hopefully it will get under control by then. I know he doesn't feel well because he's being clingy and asking me to pick him up. He tells me he's "tired." My poor baby! He comes here while I'm writing and climbs on to my lap then he squirms out of my arms and he goes back to Rey. Rey says not to worry and that he’ll help me complete my time this week. It’s been such a crazy two weeks and during this time I found this contest online. http://www.colgate.com/app/LSS247/US/EN/NationalDayDiaryProject.cwsp Lady Stick deodorant is asking women to write a diary entry about a day in their life. I wanted to enter one of my days this past week, the one when my car broke down, but in order to be considered for publication in this book your entry has to be for March 27. Isn’t that hilarious? Of course you know that nothing funny or significant will happen to me on March 27. But I’m happy to say that I’m only 15 hours from making my goal of 50 hours. I still have faith that I’ll get those done in the next 8 days, counting today. I wish all of you could have been at the Women of Achievement Awards Ceremony at the Museum of Fine Arts last night. It was amazing! I loved the piece on the history or Sor Juana that my friend Angie Moreno did for Radio Pacifica for Women's History month. I loved the performance/reading of Sor Juana's work by actress Diana Bracho. The performance by Mercury Baroque was beautiful. And finally the women who were honored last night brought me to tears. Each of them was unique in their achievement and they made me proud to be una mujer Mexicana-Americana. Congratulations to all the winners: Patricia Dominguez, Rosanna Moreno, Dr. Agustina Reyes, Gracie Saenz, Alice Valdez and Julita Rincon. You go girls! Thanks to the National Museum of Mexican Art (Chicago) for bringing this event to Houston and to the Museum of Fine Arts Houston for hosting it! I have loved learning about Sor Juana Ines de la Cruz. I must admit that the only thing I ever knew about her before this festival was that she was a nun and a writer. I had no idea that in the 17th century the only way a woman could pursue an education freely was to become a nun. Women who did not want to get married and wanted more personal freedom actually became nuns. Ironically, it was the Church that in the end silenced her when they decided that she had become too outspoken in regards to a woman's right to education. Sor Juana's response to the criticism she received is considered the first feminist manifesto of the Americas. I just turned 37 recently and it made me take stock of my life like most birthdays do, especially those that move me closer to 40. I recently found a picture of me in the 7th Grade. I'm standing against the wall of the Vanguard Wing at Hamilton Middle School. The windows I'm standing in front of are to the classroom that was my science class with Mr. Novak in 7th grade and my Spanish class with Ms. Patel in 8th grade. I can't believe I remember that. I also remember the girls standing next to me. One is Erin Doughty who became one of my good friends in 7th and 8th grade. I admired Erin so much! I wanted to look like her except she was rail thin and I wasn't. She had dark brown curly hair like mine except she was able to control hers into something somewhat resembling the wings that were so popular at that time. We're both wearing chunky plastic earrings and bracelets. I can see the Stray Cats and Adam Ant buttons on her black sleeveless t-shirt. She's also wearing black jeans and Nikes of course. The last time I spoke to Erin we were in college each doing internships. I think she was at A&M and I was at U of H. I often wonder what happened to Erin. The other girl is Xochitl Perez. The first and only Xochitl I've ever met. Xochitl passed away recently. I wasn't close to her any more but it still struck a chord in me. Xochitl and I were good friends in 7th grade but in 8th grade we had a falling out from which we never recovered. We went to different high schools but her sister was good friends with one of my best friend's sister, so I knew about her through the grapevine. In college I attended a dinner at a Mexican restaurant for one of the organizations my friends were in, and she went with her sister. I had heard that she went to school in Boston. The first words out of her mouth when she saw me were, "Boy you gained weight!" At that moment I didn't think she had changed much since middle school. I didn't see her again for years until her sister got married. I was already married and had a my daughter. She was very nice and gracious this time and she had really grown into a beautiful woman. I heard that she was either working on her PhD or had recently received it and that she was teaching. She wasn't married and she didn't have children. Sadly her sister died, from a very mysterious illness, only two years later. I saw Xochitl at the funeral and she was so sad. She asked me to please call her or to e-mail her but I'm sad to say I never did. Six months later she died in a car accident while on vacation in Mexico. The reason her death made such an impression on me, apart from the fact that she died only six months from her sister, was that they were both my age. When I went to Vanessa's funeral I felt something I didn't expect to feel. I grew up going to funerals from as early as I can remember. My parents raised us not to fear death and to accept it as a part of this life. We also believe in earthly resurrection (not heavenly) so we don't really really fear death. Funerals were almost social gatherings where we saw friends we hadn't seen in a long time. Then six months later it was Xochitl who's died. I missed that funeral. I think I found out too late, after the fact. Soon after I found the picture. It's an old Polaroid. I'm wearing jeans, a blue and white striped shirt, chunky blue and white jewelry and Nikes, of course. She's smiling at the camera. She didn't dress very fashionable. She's dressed kind of like an older lady now that I think about it. I marvel at how slim I look and how fat I felt. Erin is still significantly smaller, but Xochitl and I are the same size. I laugh. I thought I was so fat. Oh to be the same size again now. We look so young and innocent in that picture. I wish for that innocence again. We didn't know what life had in store for us. Our lives were empty canvases sitting before us and we were getting ready to throw all our paint on them. After Xochitl died I Googled her. I read all the nice things people had to say about her. I read about her death in a school district or teacher's union newsletter. People were sad at her loss. I felt sad too. Sad that we didn't stay in touch. Sad that she was such a young woman, obviously not ready to go, and that she was gone. I was sad for myself too in a weird way. Sad that it could have been me and sad that it had to be her. I have some very exciting news! I am going to be a part of a panel discussion entitled "The Myth of Writer's Block - How to Just Do It Against All Odds." The exciting part is where this panel will take place. It will be at the Chica Lit Club Fiesta in New Mexico, hosted by the Chica Lit author, Alisa Valdes Rodriguez. 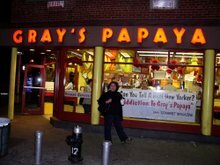 As in the author of the famous "The Dirty Girls Social Club" and one of Time Magazine's 25 Most Influential Hispanics. As some of you may remember, I was the moderator for Alisa Valdes when she was in Houston for the Latino Book and Family Festival. I had a really great time escorting her to her readings for three days and having dinner with her on her last night here. I’ve kept up with her since then and I was very honored when she asked me if I would be interested in being a part of this panel. She says it’s because I work full time, I’m a mom and a wife, and yet I still make the time to write. Well, specifically that I made the time to write a novel. So I’m really excited and I can not wait to see how it all turns out. The Fiesta is August 17-20 in Santa Ana Pueblo, New Mexico. Check back to Alisa’s site for details if you are interested in attending. Okay so I'm a mother now. Which means that things that I totally avoided in the past I now have to do. Okay, I don't have to do them but if I don't do them with my kids they will miss out because of my own selfish behavior. I know I'm exaggerating, but that's the fun of it. The Rodeo Carnival and Petting Zoo is one of those things that I would never do on my own. It is not at the top of my list of events I would enjoy. However, I have 2 kids and my cousin came to visit from McAllen, so we went. OH MY GOD!!!! First of all, I can not believe I spent $79 just like that. Is that ridiculous or what? Then, it is so exhausting! Especially when you are chasing after 2 kids. They fed the animals, petted the animals, looked at animals, rode the ponies, watched the pig race, and rode lots of rides. Yes, even the baby. He is not scared by rides. He loves them and he did not want to get off. We parked the car in my work parking garage downtown and we rode the train in, which was fun for the kids. Another cousin who lives in Houston went with us and her little boy had never gone on the train so it was an adventure for all of us. And yes I did say PIG RACE for those of you non-Texans. Isn't that hilarious? You know you're from Texas when you can say you've been to a pig race or two in your life. Yes, this was my second one in my life! I have something very very cool to tell you all but I can't tell you yet and it's killing me!! I'll tell you later when I can talk about it so stay tuned! Check out the brochure on this amazing month of events taking place in OUR city for the Sor Juana Festival. This festival is a tribute to Mexican Women during Women's History Month. All of the artists and authors are Latina women. Our very own local girl, Gwen Zepeda, will be reading at the Museum of Fine Arts on April 19. The totally cool title of her reading is, "Mexican Women Were My Mr. Myagi." I think all of us that are products of the 80's know what that means. One of the main sponsors is Nuestra Palabra Latinos Having Their Say, the literary group that has been instrumental in my writing my novel. Please show your support for Mexican women and all the organizations involved in bringing you these events by attending one or more of them. I'll be at the Frida Kahlo play, "El Entrecejo." It's Raining on Spring Break! I am not surprised at all. My whole life it has rained or been cold on Spring Break so why am I surprised at all that it's raining today and that weather.com says it's raining all week. It's my daughter's Spring Break and I'm on vacation with her. I had plans to do a lot and yes these plans included a possible trip to the beach. Oh well!! I just finished this book today. It is sooooo good! I love novels set in England, as it is, but this one is just heart wrenching! It's so well written and researched. 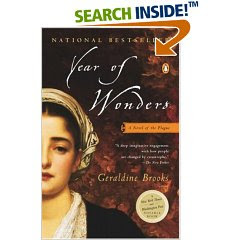 You can tell the author, Geraldine Brooks really did her homework when she wrote this book. From the details of the Plague, mining, herbs, and so many things that make this book so real. Something really cool happened Saturday. My 83 year old dad came by and I shared the book with him. He loved it! The coolest part was that he knew the music to the song, "El Contrabando del Paso" and he sang it to me. He said he remembered being a little boy in 1930 and listening to his two older brothers (that were twins and bootleggers) sing that song in harmony. After singing the song he reminisced about the Texas Rangers, injustice towards Mexican-Americans during that time, and picking cotton in East Texas with the prejudice. I marveled that I had history sitting in my kitchen as I heard him sing and then tell his stories. He liked the books so much he took it home to read more. I've been wanting to interview him on camera to record him telling his stories. I want for my kids to remember him and I don't want for them to miss out on the great stories he can tell. He is one of the last oral storytellers of his generation. Isn't it amazing that it's already March? My goodness! My daughter turns 6 next Saturday and my father turns 83 on the 30th. The baby turns 3 next month.... Amazing! It was a busy week between work, kids, homework, etc.. I didn't get a chance to write. 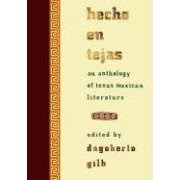 One of the things I did this week was attend the book launch of Hecho en Tejas. I am so proud of this book for so many reasons. One reason is that it's the first of it's kind. There have been other anthologies of Hispanic/Latino literature before but none like this one. This is a wonderful collection of some of the best work by Mexican American artists. And I say "work" and "artists" because it includes songs by songwriters like Flaco Jimenez, Freddy Fender, and Selena. I had the honor of attending this Mexican American Mini-Book Fair Thursday night and I heard some great writers read from their work. I had some ties to some of them. I've met Tammy Melody Gomez via the blog world. She's a poet from Ft. Worth. She's in the book and she was there Thursday night. Then there was the amazing writer Cecilia Bali from Brownsville and Houston. She read a beautiful piece that's in the book, "All About My Mother." And finally Diana Lopez. Diana read at Nuestra Palabra the very first time that I read in public at Nuestra Palabra during Women's History Month. They were all wonderful that night among the other great writers that were there, including the Editor of the book, Dagoberto Gilb. Also included in the book is my cousin Oscar Casares. He has an essay in there that was first published in Texas Monthly magazine. It's the weekend and the time to clean and get organized. I have a lot of organizing to do. I want to clear my bedroom of clutter. It'll be good for the mind.